This week – another roasted beetroot salad. What can I say? I’m addicted. I’ve been making this one for the past few months and can safely say it makes a brilliant lunch. Gremolata is an Italian garnish of very finely minced garlic, parsley and lemon zest with olive oil usually used to perk up meat and fish and it really makes halloumi sing. Halloumi, if you haven’t come across it before, is a tangy Cypriot cheese made with a mix of sheep’s, goat’s and cow’s milk that is brilliant cooked (it has a very high melting point so it doesn’t fall apart like most varieties). It’s best eaten as soon as it’s cooked (2 mins on the pan will do it) so be sure you are ready to eat as soon as the salad is ready. 2 large handfuls of salad greens – rocket, baby spinach, lettuce or this week’s purslane all work well. Scrub but don’t peel the beets then bring to the boil in plenty of water. Turn down the heat and simmer for about 30 minutes til just about tender. Drain them and allow to cool off before you peel, trim and cut them into large bite- size moons. Do make sure you cut them big as they’ll shrink by at least half in the oven. Toss in olive oil in a roasting tin and place in a moderate oven (Gas mark 5/180 degrees) for about 2 1/2 hours. Move them around every 50 minutes to ensure even cooking. When they’re ready let them cool while you get on with the rest of the salad. 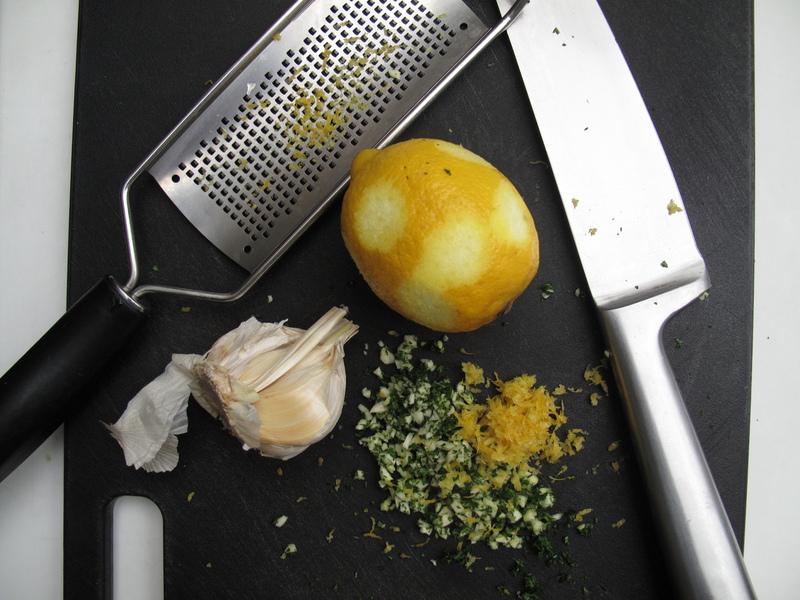 To make the dressing gently grate half the lemon rind with a very sharp fine grater. Take care not to cut into the white pith as it’s bitter and will spoil the taste of your dressing. Finely chop the garlic and parsley and combine with lemon peel. Add the juice of half the lemon, 4 tablespoons olive oil and a dash of balsamic vinegar. Toast all the pinenuts together in a dry pan til golden. Take about one third and chop them quite finely and add to the dressing. Season with crushed Maldon and black pepper. Taste the dressing and correct the seasoning if necessary. You may like to add a little more lemon juice but this can also be done at the end when you’ve put everything together. Also, remember that halloumi is a very salty cheese so don’t go nuts with the Maldon. To finish things off, divide the greens between 2 dishes and top each pile with half the beetroot then set aside. Cut the halloumi into slices about 1 1/2 cm thick. Heat a little olive oil in a griddle pan (a regular one will also do fine). Fry the cheese til golden on each side (about 2 mins). Place on top of the beetroot. Spoon over the gremolata dressing and finally, top with the rest of the toasted pine nuts. Serve and eat immediately. We’ve got more purple sprouting broccoli this week which I’m thrilled about. 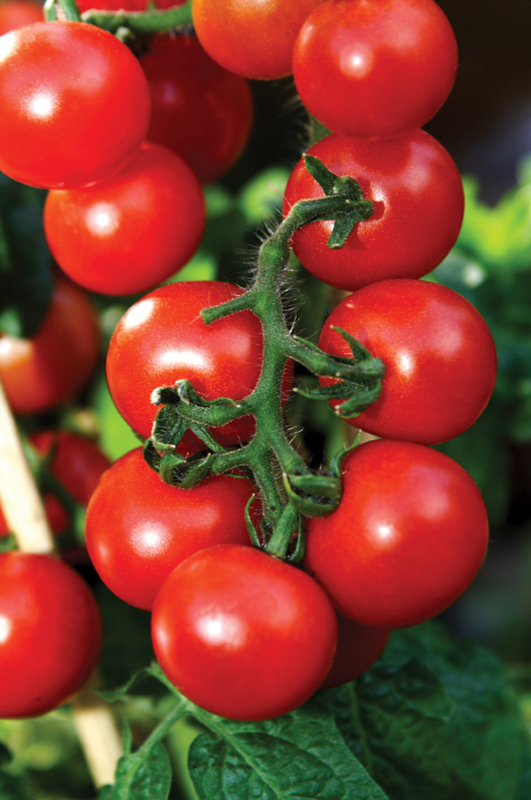 I’m hoping to eat it with polenta, goat’s cheese and red pesto – one of my alltime fav dishes. 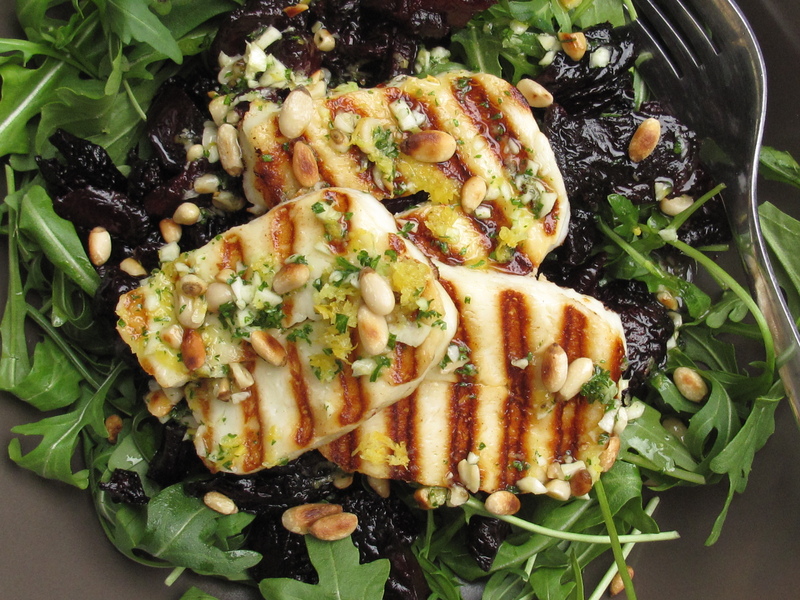 Lovely recipe, great combination.Haven’t seen the gremolata idea with beetroot before.